Mrs. Mangel developing hiccups shortly before her wedding! BEVERLY: I'm bushed. I think I'll give it a miss. 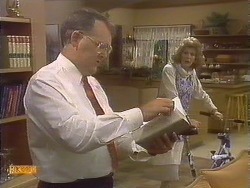 JIM (looking disappointed): But Mrs. Mangel is expecting us to *be* there. 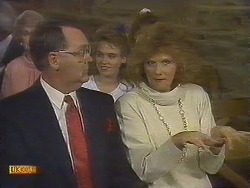 BEVERLY (mutters): She won't even notice. Jim, *you* go. JIM: What is the point? She can't even bring herself to say *hello* to me. 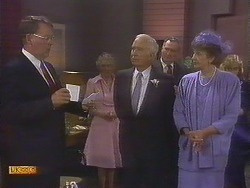 MRS. MANGEL: Oh Jane, Jane, the wedding... what's going to happen? JANE: Hey, when David Bishop was staying here, he got the hiccups and he cured himself. JANE: He stood on his head! 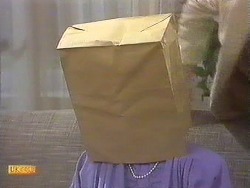 MRS. MANGEL (aghast): I can't do *that*! MRS. MANGEL: It's no use. We'll have to cancel the wedding. JANE: Nonsense, nan. Now, you just hold your breath again and I'll speak to Mr. Bishop. HAROLD (exclaims): You don't mean John's having second thoughts? HAROLD: What – she's changed *her* mind? JANE: She's got the hiccups – great big ones. They won't stop. HAROLD: Of course. Now, don't you worry – she'll be as right as rain. PAUL: How's it all going? PAUL: Ah, don't worry – there always are! JANE: Oh Paul, I don't know who's more frazzled: nan or me! PAUL: Don't worry – at least she'll be there at the church to say ‘I do'. JANE: Hmm... as long as she can get the words out! MADGE: Hiccups?! Oh, that's poetic justice! Harold, you've made my day! MADGE: But on her *wedding day*! She probably won't be able to say anything at *all*! What have I done to deserve this?! MADGE: You just think back to *our* wedding: the old biddy insisted on playing the organ and then what did she do? She deliberately played out of tune. HAROLD: Oh, it was *not* deliberate. MADGE (insists): I know what I know. MADGE: You mean she may not go anywhere after all...? Looking suddenly thoughtful, she heads to the front door without Harold noticing: he's too busy reading about hiccups in his encyclopaedia! MADGE: Ah, the blushing bride! MADGE: John insisted on that, did he, before he'd marry you? MADGE: I'd put it back, if I were you: it was an improvement! MADGE: She's going overseas tomorrow; I won't have many *more* chances. MADGE: *Bishop* is the name. 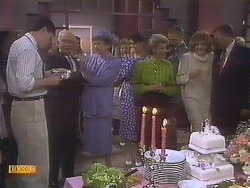 MRS. MANGEL (snaps): Once a Ramsay, *always* a Ramsay. MADGE: Yes, well, you'll always be a Mangel to me, too. I just came over to see if I could help you with your beauty treatment, but obviously you don't need me – that paper bag suits your complexion perfectly! MRS. MANGEL: This is no lady. [To Madge] Of all the taunts and jibes that I have endured from you, I would've thought that you'd never be so unfeeling as to... as to badger me on my wedding day. MADGE: Oh *you* should talk! You're about as sensitive as a blowy at a barbie! 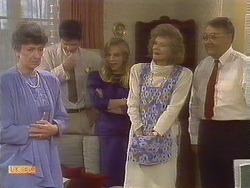 MRS. MANGEL: And you're as vicious as a scorpion. MADGE: Oh well, come on, come on, how about some *more* insults before you say thank you? MRS. MANGEL (gasps): *Me*? Thank *you*? MRS. MANGEL: What do you mean? MADGE: Haven't you noticed? You haven't hicc'ed or cupped for the last five minutes. I came over here to cure you and it *worked*! JANE: Now you can go to the church and get married – all thanks to Mrs. Bishop. I think you should thank her. A look of complete horror crosses Mrs. Mangel's face! BEVERLY: I'll sit. I hope you don't have a lecture for me. HELEN: You, er, you know that you can't change the past; you have to let it be. 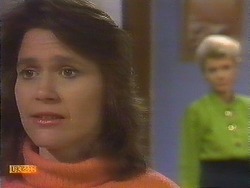 BEVERLY (asserts): There's nothing wrong in grieving for a lost baby, Helen. We don't *make* our emotions; they *happen*. 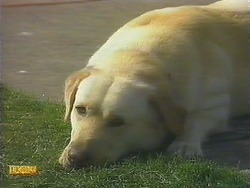 HELEN: I understand what you're going through, but I'm concerned for Jim too: you're hardly giving him the time of day. 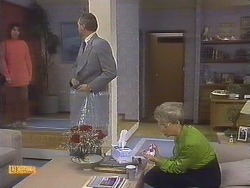 BEVERLY: You're intruding, Helen. I'll handle my *own* relationship. HELEN: Haven't you punished him enough? BEVERLY (snaps): I asked to be *spared* the lecture. BEVERLY: There's a wall between us. HELEN: Then break it down. You have a husband who *loves* you. DES: I've had my share of disaster getting towards the altar. The first two girls I proposed to, we didn't even get to set a date. JOHN (exclaims): Two girls at *once*?! DES: Are you kidding?! After them, and before Daphne, I was engaged to this girl called Lorraine, but the night before, she chickened out. DES: Oh yeah, Joan! After Lorraine, and before Daph, yeah... *she* gave me *two* days' notice! JOHN: Well, *third* time lucky, I hope. DES: No, no. Fourth. First time, *I* made it to the altar but Daph didn't! REVEREND SAMPSON: Oh, have no fears. If I know Mrs. Mangel, nothing short of Armageddon will stop her! With that, he, John and Bronwyn head inside the church. 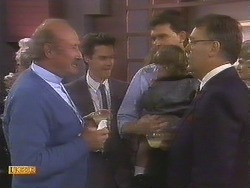 Mike joins Paul and Des and tells them that he'll take a quick shot. They stand and put on an amusing pose! MADGE: Yes – let's go and enjoy ourselves! JIM: That's all right. The hardest part was *giving* it to you. JIM: Hey, hey. I'm just pleased you're coming with me. Madge and Helen look at each other in relief and the four of them head out. MRS. MANGEL: Come on, Bouncer. Come on! Bouncer runs and leaps into the car! Harold begins sneezing as he drives off down the road! JOE: Geez, I'm proud of you, mum. JANE (warmly): Yeah, I'm proud of you too, nan. Mike takes one more photo and then everyone heads towards the church. 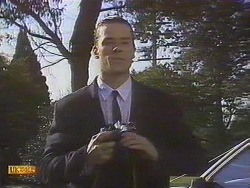 Mrs. Mangel crouches down to Bouncer and tells him that she's sorry, but he has to stay outside. 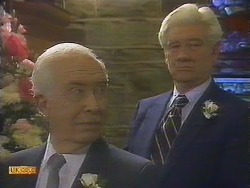 John is standing with Charles, his best man, at the front of the church. 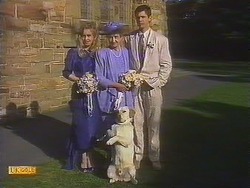 Mrs. Mangel, Jane and Joe come into the church at the back and the organist starts playing the Wedding March. 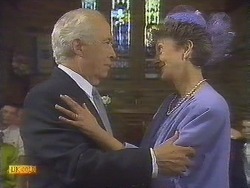 Madge looks at Harold pointedly and uses her hands to make out that *she's* playing the keyboard, in an allusion to Mrs. Mangel's mangling the tune at *their* wedding! John smiles at Charles, who gives him a wink. 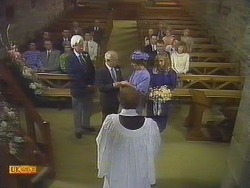 Joe escorts Mrs. Mangel down the aisle, with Jane in front of them. 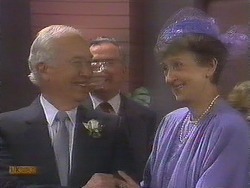 When they reach the altar, Mrs. Mangel hands Jane her posy of flowers. Joe takes a pew next to Des and Paul, causing them to have to budge up! The ceremony begins. JOHN: With this ring, I thee wed.
REVEREND SAMPSON: To be my wife from this day forth. JOHN: To be my wife from this day forth. REVEREND SAMPSON: I now pronounce you, John, and you, Eleanor, man and wife. May love and trust be with you all of your days. REVEREND SAMPSON: You may now kiss the bride. MRS. WORTHINGTON: Oh goodness. I shall have to get used to my new name won't I! But you know something? Nothing could make me happier than to be Mrs. John Worthington. JOHN (warmly): Oh, *I'm* the lucky one. JANE: Good, now that it's all over! MRS. WORTHINGTON: Oh, Mr. Clarke, I had a telephone call this morning, from your mother, in England. DES: Is that right? What did she say? MRS. WORTHINGTON: Well, actually, she even hinted that if we were going to extend our honeymoon in England, *I* might be attending *her* wedding! DES: Is that right?! From her letters, I knew she was pretty keen on some bloke over there. MADGE: Well, she's done it. Like the mountie, she got her man. 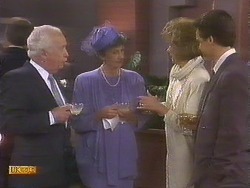 HELEN: Hmm... Goodbye, Mrs. Mangel, hello, Mrs. Worthington. MADGE: Hmm... What a shame. HELEN: What – your old feud? MADGE (grins): Hmm... Maybe just one last time...! MADGE: And, um, I'd like to wish you all the best too. We're old sparring partners and I've enjoyed our little bouts – but I'd like you to accept my best wishes for the future. MRS. WORTHINGTON (sincerely): Thank you. 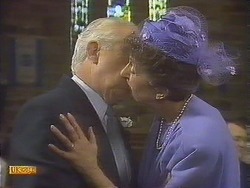 MADGE: I'm really going to miss you... Mrs. Mangel! MRS. WORTHINGTON: Did you hear that Ramsay woman? She called me ‘Mangel'! HELEN: No. That's the trouble: they went out separately. MADGE: Oh, don't worry – they'll find each other. Jim walks towards her and puts his hands gently on her shoulders. He kneels down and kisses her. She kisses him back. HAROLD: May I add that Mrs. Worthington's steadying influence will be sorely missed in our neighbourhood during her honeymoon in Britain – especially, I suspect, by the young people, to whom she's always given her advice so freely. As she, herself, has often said: you can't put an old head on young shoulders. Mind you, if you had a set of young shoulders, I don't know why you'd want anyone to bung an old head on it, eh?! MADGE: Beverly, if you can help me, I will speak to the Reverend Sampson about giving you a sainthood! HAROLD: And I'd like to thank you all very much for coming! JOE: Anyway, life hasn't been kind to mum, what with me not here, and Amanda, me sister, nicking off to get married when she got pregnant with little Janey. Oh dear! And that's why it's great to see mum smiling here today! JOE: If I could also mention that Johno and me didn't get on too good when we first met – hard to believe! – but now we're close mates and, um, I'm just glad that, you know, you're going to look after mum and not nick off to Surfers Paradise with some young sheila like *my* dad did. Mrs. Worthington looks round at everyone and smiles in delight!